I have been brought up in an environment which has always taught me religious tolerance and respect for all religions. The next place that I visited in Hyderabad was the Mecca Masjid which is located in the old city of Hyderabad and lie very close to the premier tourist spots, i.e. the Laad Bazaar, Charminar and the Chowmahalla Palace. 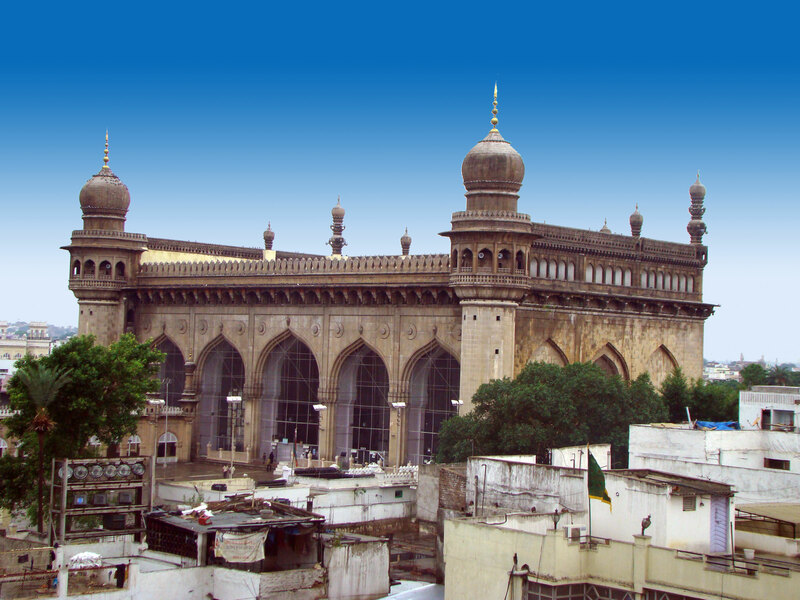 The Mecca Masjid is one of the oldest mosques of Hyderabad and is listed as a heritage building of India. It is one of the most spacious mosques in India. The fifth ruler of the Qutub Shahi dynasty, Muhammad Quli Qutub Shah commissioned bricks to be made from the soil brought from Mecca, which is the holiest site of the Islam. These bricks were used in the construction of the central arch of this mosque. And thus the mosque has acquired its name. This mosque has its significance in forming the center piece around which the entire city of Hyderabad was planned by Quli Qutub Shah. The main hall of the Mecca Masjid is 220 feet in width, 75 meters high and has a length of 180 feet. Hence it is spacious enough to accommodate as many as 10000 worshipers at a time. The roof of the main hall is supported by 15 arches. There are 5 arches each on the three sides of the mosque and a wall is raised on the fourth side that provides Mihrab. The mosque is flanked by a number of minarets. An arched gallery is built at the apex of these minarets. Above the gallery a smallish dome and a spire has been fitted. Many of the arches and domes are engraved with inscriptions from the holy Quran. Two giant octagonal columns chiseled out of a single massive piece of granite rock sandwiches the main structure of the Masjid. The delicately embellished arches of the Mecca Masjid remind the tourists of the architecture style used in the construction of the Golconda fort and the Charminar. There is a room in the courtyard of this mosque which is believed to be housing a hair of the Muslim Prophet Muhammad; this makes the place even more sacred for the followers of Islam.